We’re celebrating #NCBeerMonth and supporting North Carolina’s small independent breweries by swapping beer with some of them. 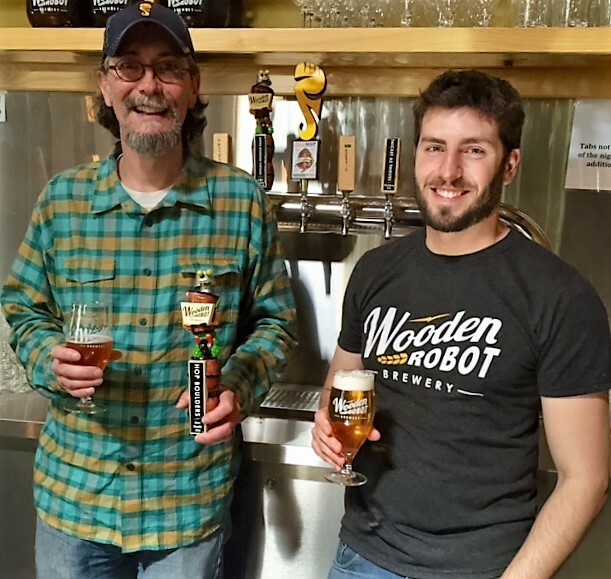 Our first round of travel is complete, we’ve exchanged our Hop of the Month beer with Brown Truck Brewery in High Point and Wooden Robot Brewery in Charlotte. Where’d your brewery’s name come from: one of the other owners, Britt Lytle, has a furniture design company, and when he was opening that they were trying to think of a name, and they couldn’t think of anything – he owned this old brown truck, and his young son said, ‘Daddy how about Brown Truck?’ So when the name for this place was being thrown around, we decided it’d be a great name for the brewery as well. What’s your favorite beer that you make? I like the saison – it’s very drinkable, and as a brewer you can do so much with it. 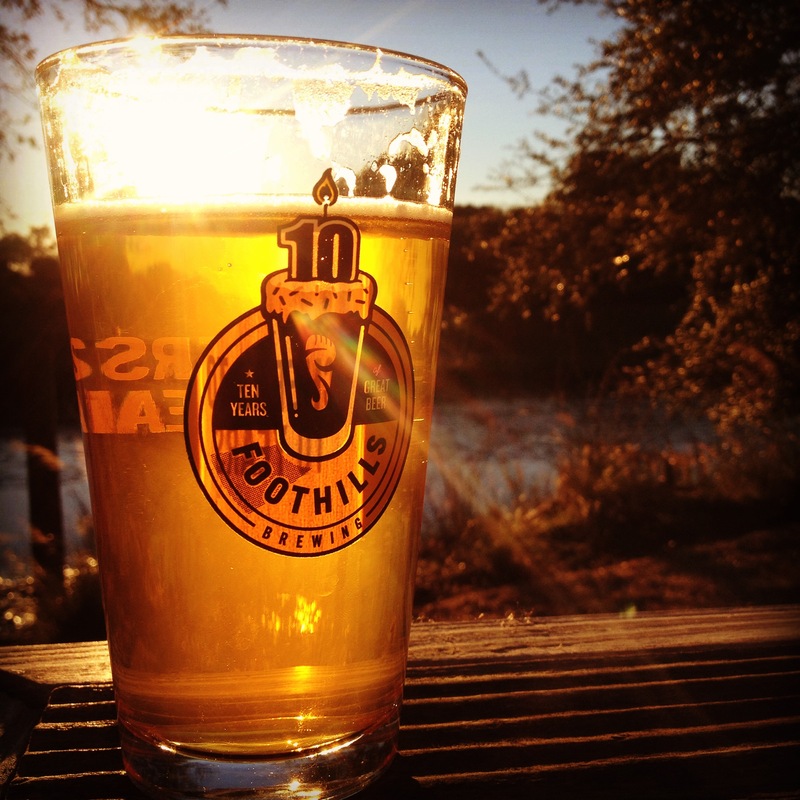 What’s your favorite beer that Foothills makes? Everyone says Jade or Sexual Chocolate, but I like the go-to’s, Hoppyum and Torch Pilsner – both very drinkable, awesome in all weather, and they never change – always delicious. 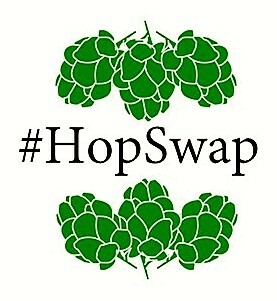 What’s your favorite part of #HopSwap? 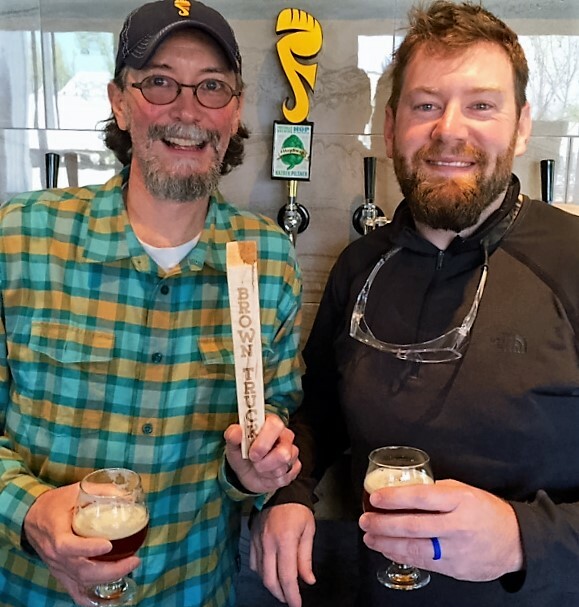 The camaraderie it represents and nurtures – getting good friends together, swapping good beers, at the end of the day it’s all about the beer and keeping good relationships with all the other brewers – and having fun doing it. Where’d your brewery’s name come from: it’s symbolic – it represents a Belgian farmhouse tradition, really artisanal local beer, and we’re applying our own American innovation to it. So the wooden represents that old school, creative artisanal way, and the robot represents our new school, scientific way of doing things. What’s your favorite part of #HopSwap? it’s really just a lot of fun, and it’s really pretty cool to be able to work with a brewery that we’ve admired and looked up to. 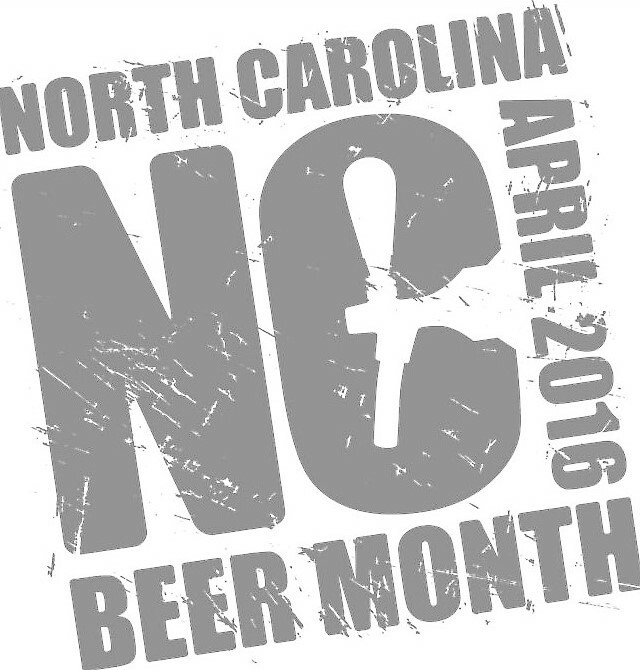 Categories: beer, beer releases, brewery, craft beer, IPA, NC Beer Month, north carolina craft beer | Tags: beer, beer releases, brewery, craft beer, craft brewery, drink local, IPA, NC Beer Month, North Carolina craft beer | Permalink. By now hopefully you’ve heard about our #NCBeerMonthChallenge, urging all NC breweries and craft beer drinkers to help out their local waterways and riverkeepers during NC Beer Month. That was not the only idea that came out of our beer-sipping brainstorming meeting. Craft beer is, by any measure, big business. And, like any big business, competition is fierce. But unlike most businesses, there exists a “coopetition” atmosphere within our sudsy realm. Despite reports of its possible demise, we like to think that atmosphere will continue to be part of the foundation of this wonderful industry of ours. We wanted to find a way to tangibly express that sentiment. What better way to support small breweries than by serving their beer? So that’s exactly what we’re going to do. 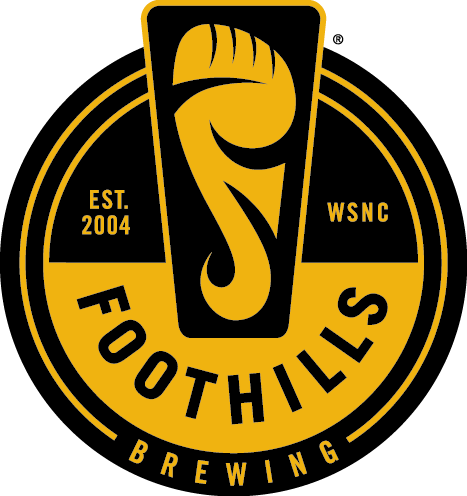 For the first time in its 11-year history, Foothills will be pouring NC craft beer other than its own. We’ve selected about a half dozen breweries in North Carolina that brew less than 5,000 barrels a year (us last year: 37,746). Once a week, we’re gonna load a keg of our Hop of the Month Series beer into the back of our car and drive it to one of those breweries, exchanging it (don’t worry we’re paying) for one of that brewery’s signature beers. They’ll serve our beer at their tap room, we’ll serve theirs at ours. We’re calling it our NC Beer Month #HopSwap. It’s proving to be a popular idea; already two of the breweries we’re trading with have arranged their own #HopSwap with others. We’ll reveal our #HopSwap partners each week; there’s some beers we’re very excited to pour. And, consequently, some great breweries we feel honored and privileged to support. Categories: beer, beer releases, brewery, clean water, craft beer, environment, IPA, north carolina craft beer, sustainibility | Tags: beer, beer releases, brewery, community, craft beer, craft brewery, drink local, IPA, NC Beer Month, North Carolina craft beer, water conservation | Permalink. 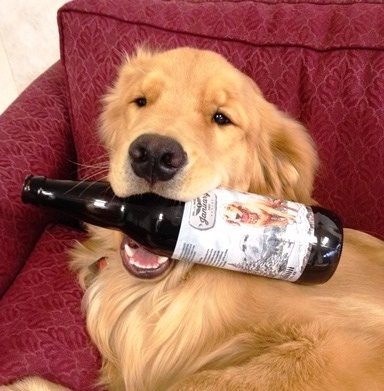 JANUARY: we debuted our #FoothillsIPAdog bottles with our very own beer dog Barley. Apparently both the beer and the bottle were delicious. By the way we donated to a dog charity in the community of each label dog in 2015 – one of our prouder accomplishments. Also, January saw the official kickoff of The Decade Parade, our year-long celebration of our 10th Anniversary. We wound up throwing 15 separate parties across our distribution footprint. Yes it was epic. 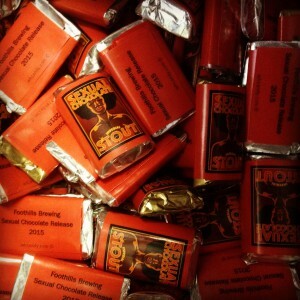 FEBRUARY: Sexual Chocolate Release – which this year came with actual chocolates. MARCH: Four Decade Parade parties. Or 1,230 miles on the odometer, if you prefer. APRIL: The Tasting Room officially opened! It’s become our pub’s fun little brother. JUNE: Our big Opening Party for the Tasting Room Opening/10th Anniversary party featured bands (including The Connells), a BBQ competition, and something that will never happen again — a 9-year vertical tapping of every year of Sexual Chocolate ever made. We threw a separate party just to showcase all that vintage beer . . . tickets sold out in 4 hours. JULY and AUGUST: were spent recovering from previously mentioned parties. 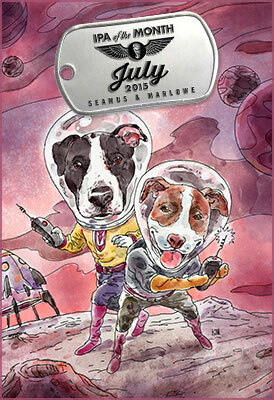 But we did find time to coax Big Bang Theory star Wil Wheaton to put his rescue pit bulls on our July IPA of the Month label. Kinda cool. 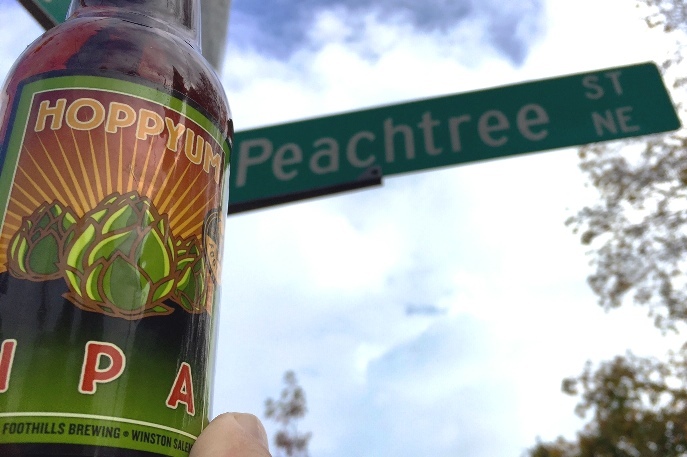 SEPTEMBER: We announced our expansion into Georgia in 2016 — something Brewmaster (and University of Georgia graduate) Jamie is pretty stoked about. OCTOBER: Between IPA of the Month, Foot Men Series, and the random brilliance of our brew staff, we averaged one new beer release a week throughout the fall. Personal favorite? Maplewood Aged Sauvignon Blanc Jade IPA. Holy crap that beer was good. NOVEMBER: Our first-ever bottling of our first-ever holiday beer, Moravian Porter. Bottles sold out in a little over a day. 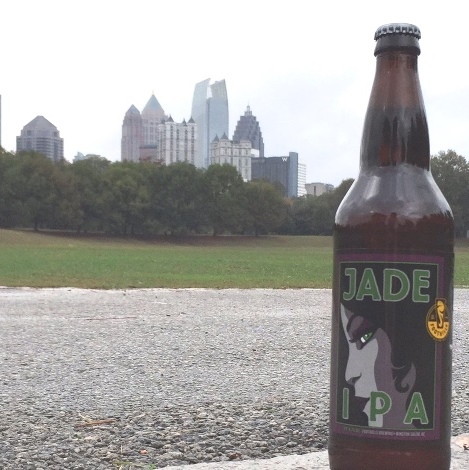 DECEMBER: Goodbye IPA of the Month, hello Jade six packs. 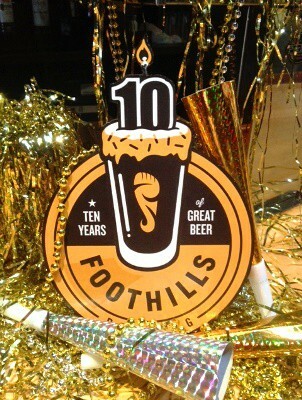 It was, by any measure, a special and unique year for Foothills. We raise a glass to you, without whom none of it would have been possible, and wish you lots of fun and success in 2016. That’s our plan, anyway. Categories: beer, beer releases, brewery, Christmas, craft beer, dogs, environment, expansion, IPA, jam bands, Moravian, music, music, north carolina barbecue, north carolina craft beer, north carolina music, party | Tags: barbecue, beer, beer releases, birthday party, brewery, community, craft beer, craft brewery, dog rescue, drink local, festival, grand opening, IPA, jam bands, Moravian, music, NC Beer Month, North Carolina craft beer, puppies, rock music, Sexual Chocolate | Permalink. That’s how we feel when we look at our new 6-packs of Jade IPA. Yes, we are finally succumbing to the voluminous passionate tweets, posts, messages and general beseeching you’ve done, imploring us to package one of your (and our) favorite Foothills brands in 12-ounce bottles. In what we feel is the formidable lineup of our brands, Jade has more than held its own over the course of its short lifetime. Since it introduction Super Bowl weekend 2011, it’s been one of our best-selling and most talked-about beers. It has indeed come a long way — from its humble and auspicious birth amongst the sights (and scents) of the 2007 Craft Brewer’s Conference in Austin, Texas. 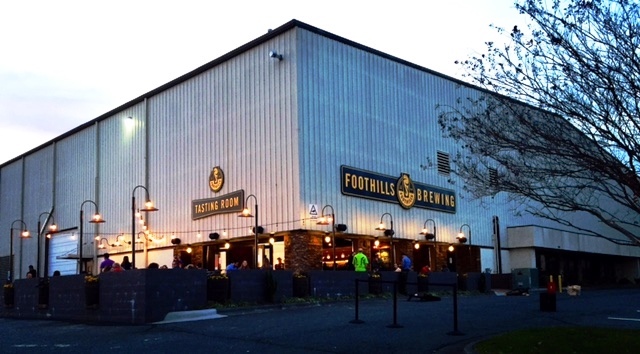 It was there that Jamie Bartholomaus, brewmaster of then-barely-two-years-old Foothills Brewing, and T.L. Adkisson, head brewer for Ham’s in Greenville, NC, were wandering through the Conference Expo, looking at equipment and raw materials and dreaming of bigger and better days for their respective breweries. As is usually the case, the hops growers (Hop Union, in this case) had several bales of hops broken open, to allow brewers to taste and smell their wares. Jamie picked up a handful of a new varietal called New Zealand Pacific Jade and took a deep whiff. Back home, both Jamie and T.L. followed up with Hop Union, trying to get their hands on some Jade hops. Both were told the same thing . . . what they’d seen (smelled) in Austin was only samples — the initial big harvest wasn’t due for another few years. Within an hour he had written out a recipe for Jade IPA — the same recipe that, with a few minor tweaks, we’re still using today. More than a third of that first batch disappeared that Super Bowl weekend, and the love affair was kindled. 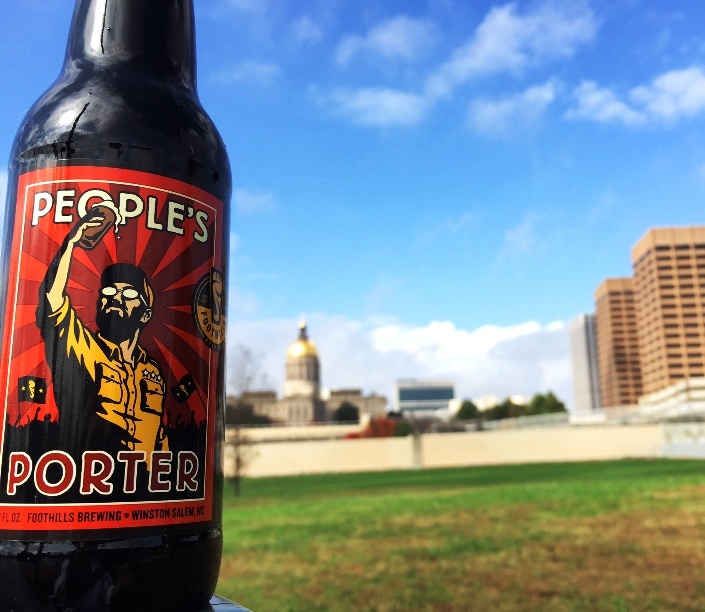 North Carolina craft beer drinkers spent the next three years downing pint after pint, pining for the day they could take this magic elixir home with them. So toward the end of December 2013, on a whim, our marketing department posted on Facebook that, if we could get to 15,000 likes by the end of January 2014, we’d bottle Jade. It took less than a month. So we got busy. Our artist Kyle Webster came up with the iconic brand logo; his vision was so spot-on that almost no changes were made to the original drawing (we did add the little logo hair lock). 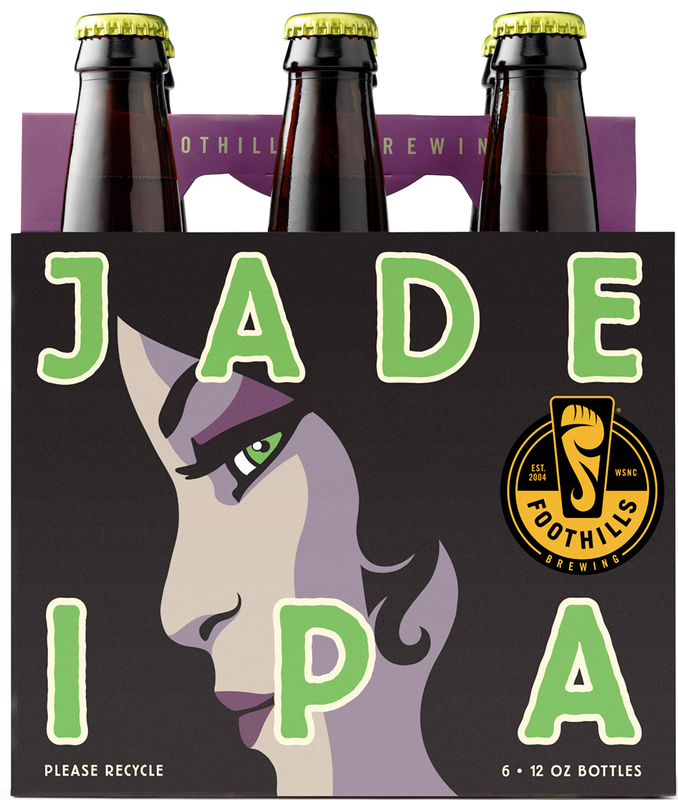 Instead of trumpeting the coming arrival of Jade bombers, we kept it a secret from everybody but employees and distributors, not releasing the info until the day bottles were actually on shelves. The result? Demand for Jade skyrocketed, and we spent most of 2014 trying to keep up. In fact, after the initial two bottling runs, demand for draft remained so high we didn’t bottle it again for 10 months. 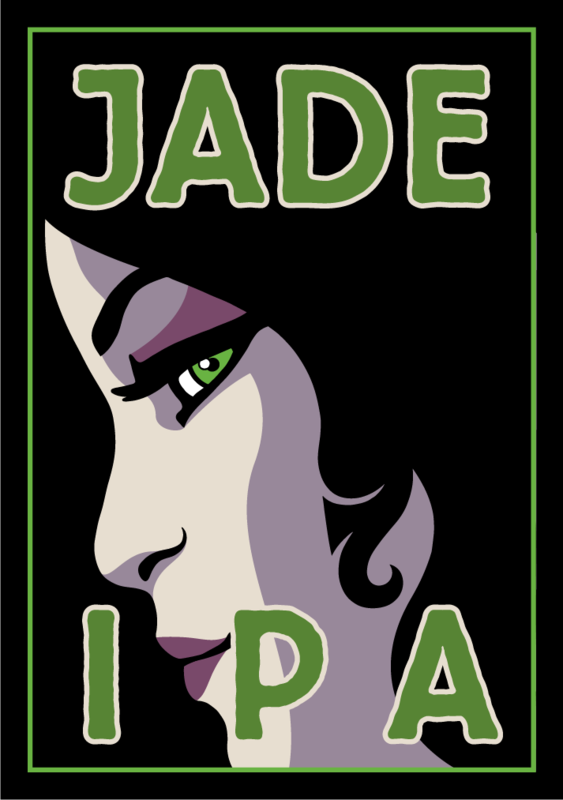 Since then we’ve installed four massive 300 BBL fermenters, so keeping up with your insatiable thirst for Jade has become a lot more manageable – to the point we’re ready to put 6-packs on the shelves. Not sure when they’ll be available, we’re aiming for early 2016, so stay tuned. Meantime, if you haven’t yet, get familiar with the Find Foothills Beer Finder on our website — it’ll help you find these when they come out. And by all means — feel free to make a pillow out of them. Categories: beer releases, brewery, craft beer, IPA, north carolina craft beer | Tags: beer, beer releases, brewery, craft beer, craft brewery, drink local, IPA, North Carolina craft beer | Permalink. What began as a crazy idea hatched over a couple of beers, and grew to become a 2-year-long series of increasingly large scope, is going away. That’s right — our December IPA of the Month will be our last IPA of the Month. The concept began as the brainchild of brewmaster Jamie and head brewer T.L., who for years contemplated the idea of producing a different, seasonally aligned beer every month in Foothills most-loved style, the India Pale Ale. We finally decided it was time to try it in 2014, and produced a series that included an ode to vintage pinup art on the bottles. That was followed by our #FoothillsIPAdog series in 2015, which has not only been wildly popular (even with Hollywood) but has also seen us donate to dog rescue organizations in a dozen different communities nationwide. But for those of you lamenting the demise of these highly anticipated beers — fear not. There’s a plan of succession. In January we’ll introduce a new monthly series — one dedicated to furthering the innovative goals on which IPA of the Month has thrived. 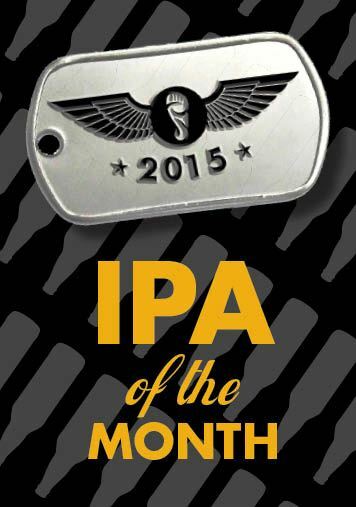 We’re taking IPA of the Month one step further — we’re starting a Hop of the Month series. Understand, these will not be single hop beers. That’s been done. No, these will be beers specifically formulated to accentuate the unique flavor characteristics of a single hop varietal. T.L. is currently sourcing hops from all over the world for this series and, while some of the beers will assuredly be IPAs, expect all kinds of different styles to show up in this series. Producing an IPA (and accompanying label) every month for the last two years has been fun. 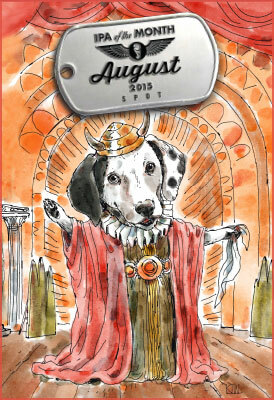 And for the record, we received enough #FoothillsIPAdog entries to supply label art for the next ten years. 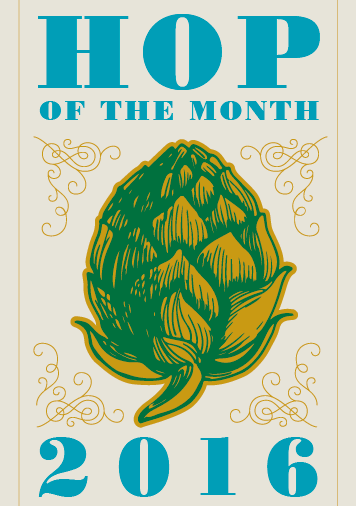 But Hop of the Month has us all pretty excited around here. Here’s hoping your anticipation of the series is just as enthusiastic. You can let us know what you think in our comments section. And stay tuned to the blog for the December announcement of our first Hop of the Month beer! 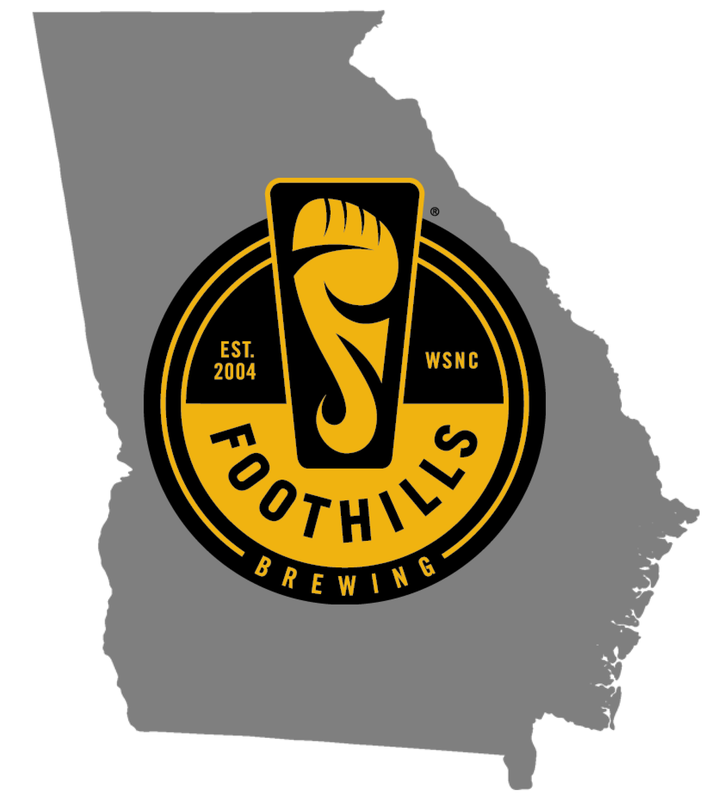 Categories: beer, beer releases, brewery, craft beer, expansion, IPA, north carolina craft beer | Tags: beer, beer releases, brewery, community, craft beer, craft brewery, drink local, IPA, North Carolina craft beer | Permalink. As we savor the waning days of summer 2015, it’s hard to not to wax nostalgic over here at the brewery. 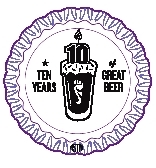 It’s been an epic year so far, what with all our 10th Anniversary celebrations, and we’re ending the summer/starting the fall with a flurry of beer releases that is at once epic in scope and broad in assortment. Barrel Aged Sexual Chocolate: We came out with this one a month early this year; the beer said “I’m ready” so we bottled it. And here’s a little secret: we cold-stored the barrels longer this year, which resulted in a little less tannin from the barrel wood, and more bourbony chocolaty flavor (at least to our taste buds). The release was, as always, a great way to catch up with our extended Foothills family and share some great times (not to mention those sleeping-on-the-sidewalk bonding moments). The pub is all tapped out but (as of the moment this is being written) there’s still some left at the Tasting Room. August IPA of the Month: “Spot” is an ideal summer IPA, with nice synergy between lemony Sorachi Ace hops and the orange/citrus character of Simcoe hops. Some German Tradition hops add a little earthiness and compliment the sweetness in the malt bill. Good way to round off the hot weather and start working this series into fall. None left on draft but a few bombers left at the tasting room. Pumpkin: I count close to a thousand pumpkin beers on Beer Advocate. Not sure how you stand out in a crowded patch like that, but there are a couple of unique things about our own Cottonwood Pumpkin. For one, instead of using canned pumpkin, we use actual fresh pureed pumpkin; also, every spice we use (nutmeg, cloves, cinnamon, cardamom, ginger, and allspice) is organic. Oktoberfest: We’re pretty excited about this one, it’s always been available on draft and in bombers, but this year for the first time we’ve included it in our year-round Seasonal Series, in 6-packs and 12-packs. If you don’t know anything about the Oktoberfest beer style other than the raucous shindig thrown every year in Munich, it has an interesting history. Crown Prince Ludwig got married in 1810, and magnanimously decided to invite the entire town of Munich. The resulting party was sufficiently epic to warrant throwing another one the following year. They eventually coined this annual celebration Oktoberfest, and brewed a beer specifically for the occasion; a dark, sweet amber lager with notes of toasted bread and roasted almonds. Now you can have a little bit of Prince Ludwig’s legacy sitting in your fridge. A word here about the dreaded and much-maligned ‘seasonal creep’: some seem inordinately bothered by seasonal beers (like Oktoberfest and Pumpkin) coming out ‘before their time’. While it really doesn’t bother us, we do get your point. It’s the same feeling you get when you see Christmas decorations before Halloween, right? If it bothers you that much, may we suggest doing what we do when we see those decorations: ignore them until you’re ready to pay attention to them. If you’d like to educate yourself on why this has become a thing, this is a good place to start. September IPA of the Month: as the weather cools, we usually ramp the ABV back up in this series, and September is no exception, weighing in at 6.9% to go with 72 IBUs. After the lighter, fruitier flavors of the summer month IPAs, a generous double dry hop with Chinook will give this one some hefty pine notes to go with a nice hint of grapefruit. And the label dog, as usual, is adorable. 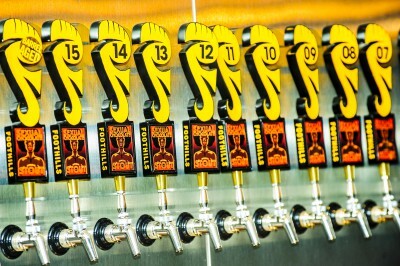 Foot Men Series Wee Heavy: Of the beer styles brewed in Scotland, There are both “Scottish” and “Scotch” ales . . . the latter generally falling under a category known as “Wee Heavy”. Sweeter, fuller in body, and higher in alcohol than Scottish ales, the name derives from the small (wee) 6 oz. bottles in which Scottish brewers sold their strongest ale in the late 1800s. Our next beer in the Foot Men Series — highlighting the vast talents of our brewing staff — will be a Wee Heavy brewed by Brent. Super malty and sweet, unfiltered, it’s a hardy autumn beer full of toffee and raisin notes – and at 8.3%, the perfect pint to take the nip out of the air when it starts turning cool. You’ll have to roll your r’s and say “Brrrent’s Wee Heavy” when you drink it. 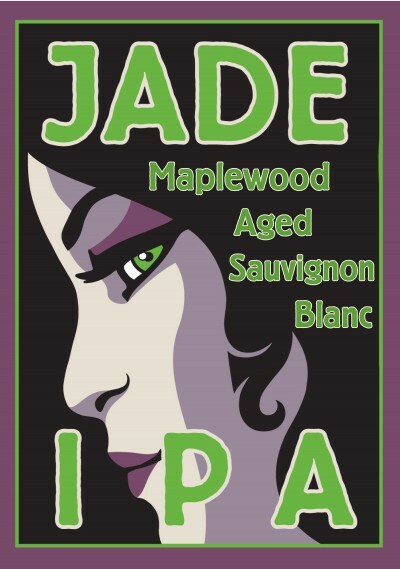 Sauvignon Blanc Wood-Aged Jade: this one’s the brain child of our head brewer TL (as was Jade, by and large). TL’s always been intrigued with New Zealand Jade hops, and is equally curious about complimentary flavor profiles. So he took some sweet maple honeycombs and soaked them in Sauvignon Blanc wine, from grapes grown in the same NZ region as our Jade hops. The result has an intriguing blend of fruity and acidic notes, balanced by sweetness in the maple used to age it. Fairhaven Helles: this beer is part of an annual tradition, we invite the winner of the Gambrinus Cup homebrew competition to brew their winning beer at the pub, then have it served at the Carolina Renaissance Festival. This year’s recipe is a Munich Helles brewed by David Jones. The Helles style is so popular in Germany that it’s actually replaced the Oktoberfest style . . . at Oktoberfest! A straw-blonde lager that’s at once light and intensely flavorful, it’ll be a welcome addition to Fairhaven Village at Carolina Rennaissance Festival in Mooresville this year beginning October 3rd. Blueberry Pale Ale: This one we came up with to put on at Lowe’s Beer Dens. If you’ve had our Carolina Strawberry, then you know we do fruit beers a little differently; the fruit’s a little more subtle and acts as a complement to the beer ingredients, rather than serving as the main flavor ingredient. This beer is no exception . . . as our head brewer describes it, “it’s a pale ale that just happens to have blueberries in it”. Stay tuned to our social media pages for exact release dates on all these. Belly up everyone . . . Autumn’s gonna be awesome. Categories: beer, beer releases, brewery, craft beer, homebrewing, IPA, north carolina craft beer | Tags: beer, beer releases, brewery, craft beer, craft brewery, homebrewing, IPA, North Carolina craft beer, Sexual Chocolate | Permalink.